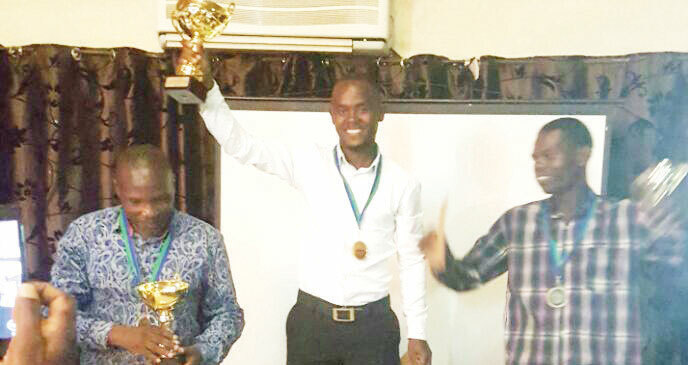 Chiletso Chipanga made history over the weekend by winning Malawi’s first ever chess gold medal after emerging champion during the Africa Amateurs Chess Championship in the Zambian town of Livingstone. Chipanga made a perfect start to collect eight points with a day to go before the end of the competition on Saturday. The points were enough to propel him to a historic triumph. The Malawian lost his final game on Saturday to Andrew Sakala of Zambia, but the result did not change anything as Chipanga was just waiting to be crowned. The only effect of the controversial loss was that Chipanga tied on eight points with another Zambian, Leslie Chikuse. But officials used the head to head rule to determine the winner and handed the trophy to Chipanga. Renowned for his combative style of chess, Chipanga’s casualties included current Zimbabwe champion Dhemba Jemuse and Kiddy Makwaya of Zambia. Chipanga pocketed $1000 (about K717,000) for his achievement. The win makes him eligible to compete at the World Amateurs Chess Championship in Italy next month. Zimbabwean champion, Dhemba Jemuse, finished third with five points whereas Nakabo Peninah of Uganda won the ladies’ category after amassing seven points out of nine. Chipanga thanked Malawians for the support rendered to him through social media. “I thank various officials who supported my trip and many other fellow countrymen for pushing me to get this result,” he said. Several chess personalities such as Susan Namangale, Kezzie Msukwa, Gilton Mkumbwa, Mark Chikoko, Wasoka Chirwa, Dan Chioni and Ulemu Chiluzi joined hands in offering various forms of support to Chipanga for the competition. Meanwhile, the chess fraternity is expected to give Chipanga a hero’s welcome at Kamuzu International Airport in Lilongwe as he returns from the tournament today. Chess Association of Malawi Executive Member, Susan Namangale and CBR Travel and Tours Managing Director Lisungu Chirwa contributed money amounting to K208,000 to enable the triumphant Chipanga fly home from Zambia.